I first ran the Dartford Bridge 10k or The Bridge 10k as it's also known, back in 2013. That race went pretty well. 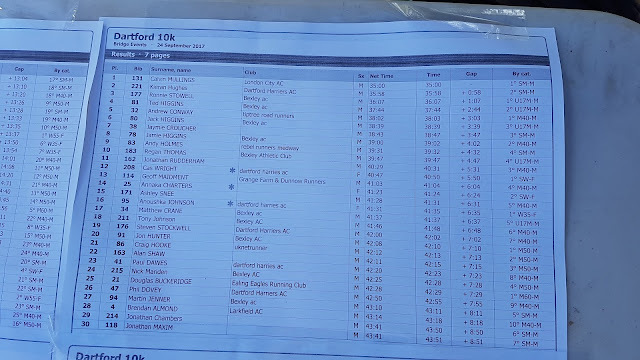 I paced it perfectly and I came away with a new 10k personal best. This time around, an all-time 10k personal best was not on the cards but I was hoping that I'd be able to shave some time off of 2013's time. For the record it's almost perfectly flat with just a few minor changes in elevation to deal with. In the years since the last time I ran this race, the course had been changed at least once, but 2017's race was run on the same route that the 2013 race used. The course starts with a short tail, followed by two full laps of the perimeter road. At the end of the second lap, a smaller loop is run using a the first quarter of the main lap. The course breaks off and leads back towards the main race HQ area where the finish is found. 2017's race really was a great example of terrible pacing. The only consolation I have is that all the runners I spoke to post-race made exactly the same mistake. 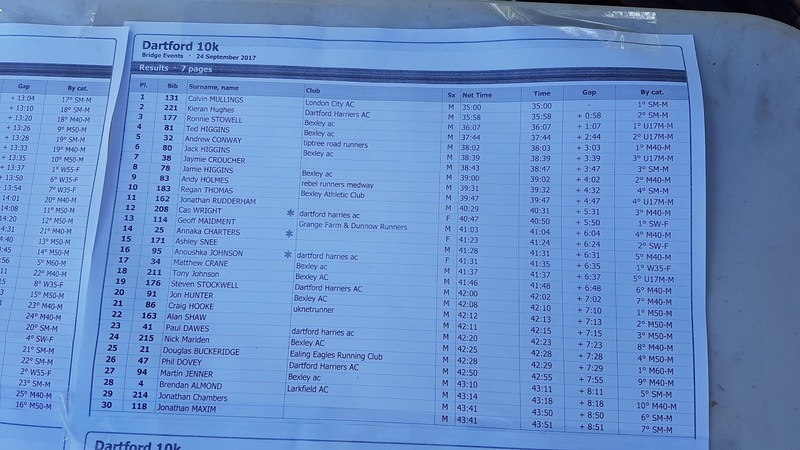 To sum it up, my current flat 5k times are somewhere around 20.30 which works out at a pace of about 4.06 per kilometre, and I ran the first kilometre of the 10k in 3.52 (according to my Garmin). That pretty much set the scene for a pretty horrendous race experience. My pace gradually slowed throughout the first half of the race. I ran that first 5k in somewhere between 20.20 and 20.30. The second half of the race was, as expected, quite a painful experience and my pace eventually dropped as low as 4.20 per kilometre. The second 5k came in at around 21.30 rounding off my finish time at exactly 42 minutes. An appalling set of splits considering this was my 29th 10k race and I should know better. The good news is that I was able to increase my pace over the last kilometre and finished on a high. After putting in such a hard effort run, it took me ages to recover and my chest was still aching about 10 minutes later. Plenty of water and food followed and eventually all was well. Now the big question is 'did I beat my time from the 2013 race?' - the answer is 'yes' and 'no'. Let me explain. My official chip time from 2013 was 21.50 and my official chip time from 2017 was 22.00, so on the surface of it, it looks like I was slower. However, the 2013 race started about 60 metres further along the road and that means the 2017 course was longer. Looking at my GPS data, it took me approximately 14 seconds to reach 2013's start point, so if I was to adjust the course in order to make a direct comparison, my 2017 time would have been approximately 21.46 which is indeed faster! The event also has a 2k kids run and after not being interested for the first part of the morning, my daughter suddenly wanted to enter the kids race when she saw my medal. So after paying the £3 entry fee she got in place on the start line for her 1 lap 2 kilometre run/race. She ran this race once before, in 2014, and back then put in a time of 18-and-a-bit-minutes. The nature of the course meant that I wasn't comfortable leaving her to negotiate the course alone. It's not that I doubt her ability to follow directions, it's that the route crosses roads and not all of the crossing points had marshals on hand - something that I think should probably be rectified in future years, especially now that more of the land has been built on. So I filtered into the back of the start funnel hoping to run the entire way with her, but of course she had sped off into the distance with one of her new-found buddies. By the time I caught up with her she was maintaining a decent pace of around 6 minutes per kilometre and looking in good shape. We made our way around the course and were soon heading towards the finish line. It was at this point that she decided that I was running too close to her and was cramping her style, and she told me to run further away from her. Naturally I dropped back a bit and let her put in her final push for the line. With a finishing time of 11.52 according to my Garmin - If the course was a perfect 2k this means that she smashed her previous best 2km time by over 2 minutes. There were no official results for the kids' race.